...The delivery of knives bought online to private addresses is to be banned under a package of measures to tackle knife crime to be announced by the home secretary, Amber Rudd. Knives bought online will in future have to be collected in person, with retailers responsible for checking that all buyers are 18 or older. New powers are also proposed for the police to seize banned weapons such as zombie knives, knuckledusters and throwing stars if they are found in someone’s home, and to arrest those involved. The proposed new knife crime offences are to be subject to a consultation this autumn. They follow a Guardian investigation that found it was possible for teenagers to order age-restricted flick knives online and have them delivered to a private address without an age verification check. Rudd’s announcement of further action to tackle knife crime comes in advance of publication of the lastest quarterly crime figures on Thursday, which are expected to show a further rise in knife crime. There were more than 32,000 knife crime offences in England and Wales in 2016, 14% more than in the previous year. There were more than 4,000 hospital admissions for assaults involving a knife in England in the 12 months to March 2016, with 771 of those injured under the age of 19. ....The families of murder victims have led a protest through central London against the number of young people stabbed to death in the capital. The murder of 17-year-old Alfie Stone in west London earlier this month was the 13th fatal stabbing of a teenager in London this year. Recent weeks have also seen stabbings on the premises of two south London schools. The Met has pledged to do all it can to reduce knife crime. The families of Alfie Stone, 21-year-old Josh Hanson and 24-year-old Sabrina Moss were among the activists who gathered in Trafalgar Square before proceeding to New Scotland Yard via Downing Street. Protesters chanted: "We are losing a generation", and "enough is enough". A list of the names of young people killed was read out in Downing Street. In a statement last month, the Met said: "There has been a disturbing increase in the number of murders and stabbings, often with young black men the victims." It continued: "We will do all we can to reduce knife crime, to tackle London's gangs and take more knives and weapons off our streets." Met operations are under more intense scrutiny than usual in the build-up to Chancellor George Osborne's spending review, with several prominent officers stressing the dangers of cuts to their budgets. Speaking on the BBC Sunday Politics programme, Labour MP David Lammy said: "Knife crime is spiking because officers aren't there to know the young people." But Conservative MP Victoria Borwick, a former deputy mayor of London, said it was "extremely unlikely" that policing was going to be cut, and that the key was that the Met should decide how to allocate its resources. People carrying knives are being encouraged to surrender their weapons during a community initiative to tackle knife crime in Birmingham. Three secure metal bins where people can dispose of weapons have been set up across the city. It follows several stabbings in the city last year. The knife surrender is under way with three secure knife bins and plans for a further six. The police say the term amnesty is wrong because there's never a reason to carry a knife and people should surrender them. But this is supposed to be community led, with young people, church groups and charities getting involved. Knife crime in Birmingham has actually fallen by 75% over the past decade but over the past ten months there's been a slight rise about 3%. Will the surrender work? Just three bins at the beginning of the campaign mean it's low level for the moment. Everyone is agreed that education has to play an important part in getting the message across not to carry knives. In London, 23 bins have been put on the streets and 10,000 knives handed in. Those involved say just one person changing their attitude can save a single life. A knife surrender differs from an amnesty in that there is no temporary suspension of laws against carrying a knife. Police and Crime Commissioner (PCC) for the West Midlands, Bob Jones, announced the plans last October. Police figures showed that in 2012-13 there were 1,615 knife-related incidents in the city, although police said over the past six years knife crime had fallen by 63% across the force area. The force said there were plans for more knife disposal bins "in the near future" and there was "no fixed duration for the initiative". Readers pondered a November 2014 article reporting that British police were undertaking an effort to disarm the citizenry of "pointy knives." The new “Save a Life — Surrender Your Knife” program is in full swing and police are telling us that they have joined forces with an already growing trend in the United Kingdom to ban “pointy” knives. “The amnesty was extended for a further week owing to its success,” Lancashire Police representatives explained. 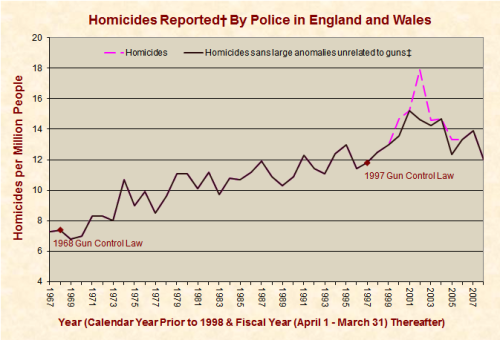 With Knife Murders Spiking After Gun Ban, UK Urges ?Save a Life?Surrender Your Knife? Hammers and hatchets are next on the block. And yet,,,;The murders, will go on. Someone who thinks he can make the world a better place by removing anything that can be used as a weapon by any person. The UK monkey people come to mind. After reading mr wonder's original post, it appears that they are targeting "assault knives", ie. knives that are designed to kill or maim, or as I would call them, "scary looking". That is hilarious. If we take away scary looking knives, or ban people from buying them, they won't resort to just simple kitchen knives to attack people. But what if they do? Will they then take the next step and take away ALL knives thereby making home cooking practically impossible? If so, they will have to place restrictions on companies preparing food for consumption that they have to make everything bite size or smaller. Pretty soon, they government will just lock people in rubber rooms and spoon feed them for their entire lives so they don't hurt themselves. I am not surprised.The UK is a country that also banned pepper spray and tasers.